New TV series of 10 episodes “Bangers and Cash” premieres this Thursday 18th April on Yesterday channel at 8pm. "Believe it or not, one of the most exciting finds in the whole series is a decrepit old carcass of a car, crammed with old squash bottles and draped in dust in a garage. But this is a true diamond in the rust, because it just happens to be a bona fide Mini Cooper S. Which, as any classic car buff will tell know, is one of the rarest and most sought-after motors in British history. A souped-up, super-duper spin-off of the original Mini Cooper, this is pure Swinging Sixties cool on four wheels. It won the Monte Carlo Rally on multiple occasions, and Mick Jagger was just one of the celebrity owners of this legendary model. Indeed, the speed and nimbleness of the Mini Cooper S also made it a hit with the British police, who used it as a plainclothes vehicle. You can see why the Mathewsons are just a tad excited when they stumble across this piece of history..."
Edited by mab01uk, 14 April 2019 - 09:53 AM. how much they will actually show. I bought my old Thames Camper from there around the time they were filming. As it had sat there for quite a while I'm hoping to spot it in the background! I thought the shell looked saveable to be honest.Obvs a major resto but a great project.I wonder how the buyer's getting on. The most likely scenario is that it will be re-shelled into a donor Mk.1 shell. However, with a jig that shell could be rebuilt, although virtually every panel would be new. I have a friend who has the right jig and I guess it would cost around £6000 plus paint. Alternatively, a new Heritage shell could be used although the cost would be very high. Hi, I am the producer of B&C and thank you for the kind comments about the show, no ‘histrionics of false deadlines’ - I cannot imagine what you mean We are trying to make an authentic show that’s true to car people as well as the cars. It’s early days for the series as last night was ep 1 of 10 and the channel need to see how series 1 goes- but the follow up will be in a ‘special’ with no transmission date as yet. Mr Bridger - Was the Thames Camper regency red with a white flash? It was class. I really enjoyed watching it. It was straightforward and no nonsense unlike some other classic car TV shows. Edited by MatthewsDad, 21 April 2019 - 06:22 AM. Just seen - great job, really nice, and colour swop looks superb. 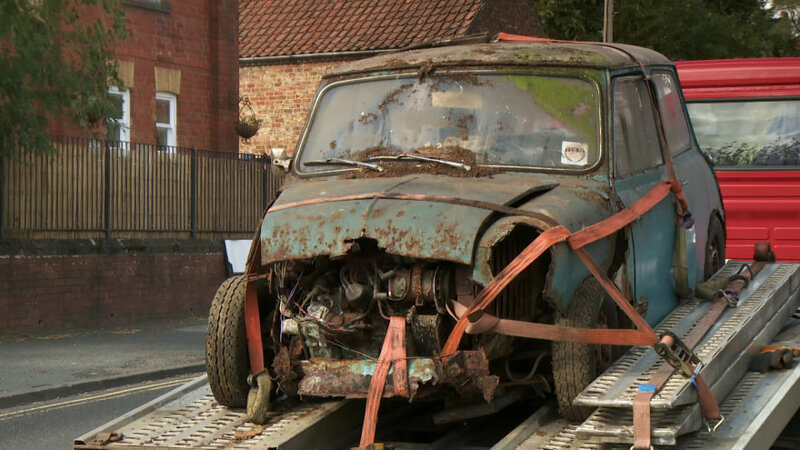 There is a mini pickup barn find in coming up in next weeks auction. It will hopefully feature in a later show. I'm currently restoring an almost identical 65 Surf Blue/OEW S, which was as bad as this one, if not worse in some areas, having been off the road in a (in more recent years) leaky shed, since 1973. I have not re-shelled it but replaced many panels instead. Some people may say to replace this many panels is a re-shell...but it is not. It's been hard work but 14 months of evenings and weekends and the shell is almost ready for the paint prep stage. To re-shell that car would make it just another re-shelled S. The Heritage shell is now pretty good but is not a substitution for the original S shell. I'm hoping the new owner finds a good restorer and saves the original shell. It will make the rescue so much more interesting. Thinking logically, all body panels are available. However, the problem is alignment and geometry. With a body jig, a good MIG welder and, ideally, a spot welder it is possible to re-build that shell to be better than a new Heritage shell. The reason cars get re-shelled is because it is easier if a shell requiring less work is available. In this case it is for TV so a rebuild is likely. It seems unlikely that the notorious TV restoration prog where one MGB was substituted for another will happen again. I think it a shame to restore this car as its originality would be lost, just clean it up, mind your fingers on the jagged edges though, sit on it and watch it go up in value.